It is customary to fix round the walls of all rooms, halls, passages, etc., a finishing of some description, in order to cover the angle of junction between wall and floor. These finishings vary in name according to their different characters. The simplest of all forms is that of a plain fillet of wood nailed to the floor, adopted only in common class work, or in rooms used as stores and warehouses. Boarding placed along the floor, flat against the wall, to a height of from 7 to 15 inches above the floor, is known as Skirting. This may be of two kinds - Plain and Built-up or double faced. 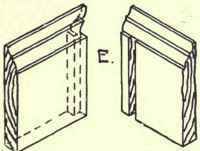 Plain Skirting consists of a single board only, having a moulding worked on its upper face edge. Preparation has to be made for the fixing of all skirtings by means of Grounds. These consist of two narrow strips of wood, of the thickness required for plaster. 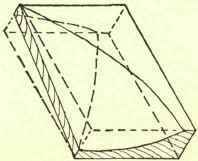 The lower one, sometimes called a Fillet, is fixed along the floor; the upper one is placed so that it shall be not more than 1/2 an inch below the top edge of skirting. It is splayed to form a key for plaster as shown at B, Fig. 90. The top ground is fixed before the plastering is done, and acts as a screed to carry the plasterer's rule. Short upright pieces, known as Blockings or Firrings, are also placed between the grounds, and spaced about 3 feet apart. Wood plugs are sometimes driven into the wall in the joints of brickwork, for nailing to. The method of forming a plug is shown in Fig. 91, where a short length of timber is taken and two opposite angles are cut off with an axe. This gives the piece of timber a wedge-shaped section, which winds throughout its length, so that when it is driven into a wall it cannot become loose by shrinkage. More commonly the case in all good class work, Fixing Bricks are inserted, which are bricks made from a mixture of coke breeze cement and oil. Nails or screws can be driven into them; and being made the same size as ordinary bricks, they can be bonded in with the other work. They provide the best fixing for all joiner's work. Skirtings are frequently merely scribed to the floor, - that is, fitted close down on to it. This is bad, as in case of shrinkage a space occurs, creating a harbour for dust and vermin. The correct method of fixing is by means of a groove and tongue joint as shown at B, Fig. 90. The board should also be fixed with the heart side outwards, as in case of any tendency to cast the top edge will then bind more closely to the wall. The correct face is shown by the curve of the annular rings. The external angles of skirtings should be mitred and cross bradded as at D, or mitred and dovetailed in the case of hard wood, as explained in Fig. 89. Internal angles should have the square portions tongued and grooved, and the mouldings scribed as shown at E.
Built-up Skirtings consist of two or more pieces tongued together, and arranged in such a manner that, while each piece is moulded separately, the whole when put together forms one continuous moulding. They are more elaborate than ordinary plain skirting, are frequently executed in hard woods, and have less tendency to warp and twist owing to their being made up of several small pieces. Fig. 92 gives an example of a built-up skirting. As in the case of all hard wood or polished finishings, nail or screw fixings would be most unsightly, Secret Fixings are generally resorted to. These either consist of screws driven into the grounds or backings with the heads left projecting from \ to | of an inch, slots being formed in the back of the skirting to receive them as shown at A, Fig. 93, or small dovetail pieces of hard wood are secured to the ground and corresponding dovetail mortises are made in the skirting, as shown at B. When the woodwork to walls is carried up to a height of from 3 to 4 feet it is termed a Dado. When continued higher, say from 6 to 7 feet or the full height of room, it is generally given the name of Wainscoting or Wall Framing. Dados admit of a great variety of treatment, the framing often being filled in with richly carved panels. They may be divided into two kinds. Those constructed of boards placed horizontally and tongued together, being known as Horizontal Dados; and those consisting of a framework filled in with panelling, called Framed Dados. Horizontal Dados are usually constructed of stout boarding 7/8 or 1 inch thick, with ploughed and tongued joints, either plain, beaded or V-grooved, dovetail keys or battens being fixed to the back to prevent casting. Where a dado is fixed the skirting is generally planted on the face of it, forming a base or plinth, the top of dado being finished with a neat moulded capping. 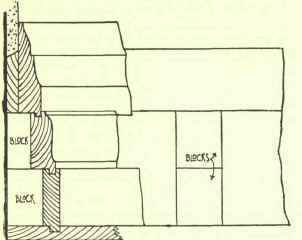 This capping, where of sufficient width, is sometimes provided with either a small ledge or groove, so that photographs or other small articles may be safely placed thereon if desired, as shown in Fig. 94.